Four of our Upper School students attended the annual AIPAC Schusterman Advocacy Institute High School Summit in Arlington, VA. Together with over four hundred other high school students, they had the opportunity to learn skills and engage in meaningful dialogue about how to be effective Israel advocates and political activists in high school and beyond. They attended a number of important sessions, from briefings on the the Israeli-Palestinian conflict and Iran's rise as a nuclear power, to instruction on how to combat the BDS movement and other anti-Israel sentiment on college campuses. Students also participated in special "skill-labs," which prepared them on how to lobby and petition Congress to support important pro-Israel legislation. 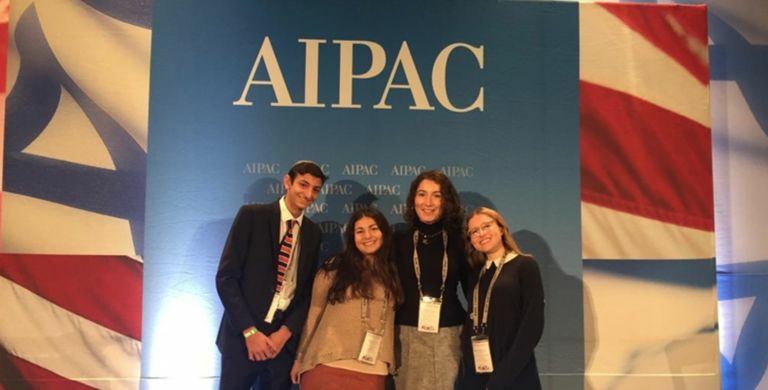 They heard presentations by AIPAC professionals who themselves were trained to be passionately involved when they were in high school and later became lobbyists and government officials who are directly involved in this important work. The culmination of the three-day conference was the chance to turn their training into action by going to Washington to lobby one of our own congresswomen from New York, Representative Carolyn Maloney, and to brief the congresswoman's staff on several relevant issues that Israel faces today. This trip was a wonderful experience for our students to be further educated on what they can do as student leaders to get involved and help support AIPAC's mission of strengthening the U.S-Israel relationship in the government, on high school and college campuses, and throughout American society.